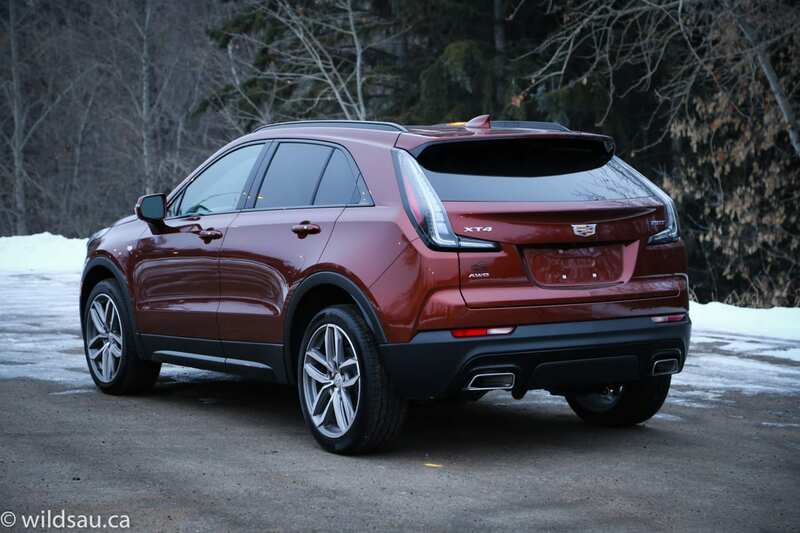 Cadillac’s all-new crossover, the XT4, comes at a time when Cadillac needs a winner. And I think they’ve got one on their hands. I spent a week in a Sport trim XT4 and came away impressed. 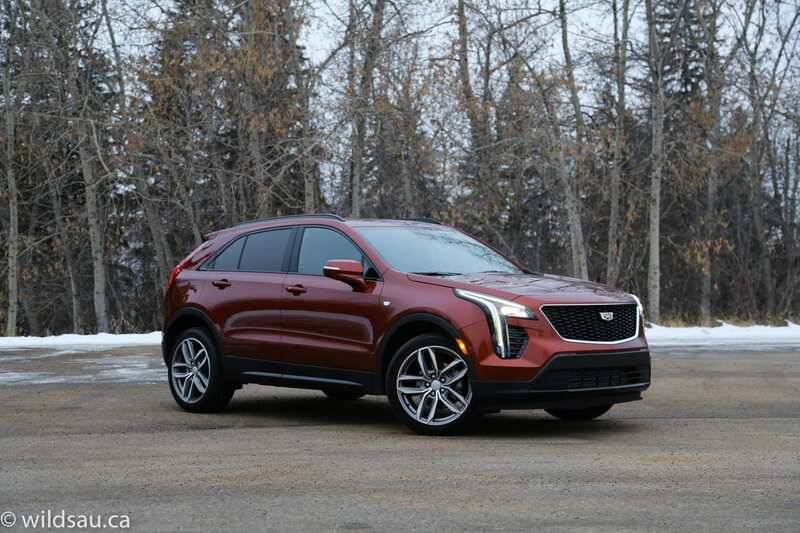 Cadillac has long sought to bring younger buyers into the fold, and although their recent offerings have helped, the XT4 should definitely appeal to new, younger demographics. 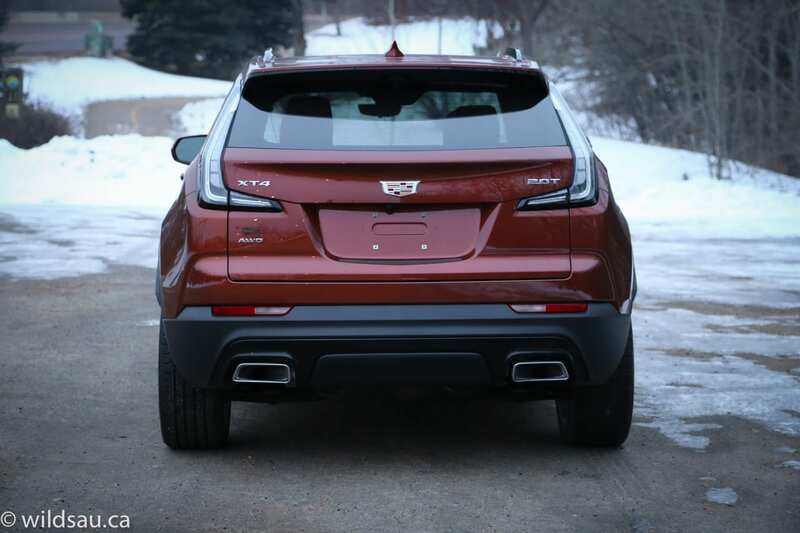 The XT4 is tall and sports a very short rear overhang. 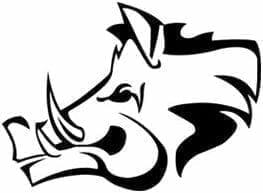 It has style, presence and looks as confident as it does fresh. My vehicle’s Autumn Metallic won’t be for everyone, but I thought it suited the XT4 nicely and it certainly turned a lot of heads. I really liked the high-gloss black mesh grille – which is specific to the Sport trim. I also enjoyed looking out over the sculpted hood with a hint of power dome on it, which adds a bit of muscle to the look. 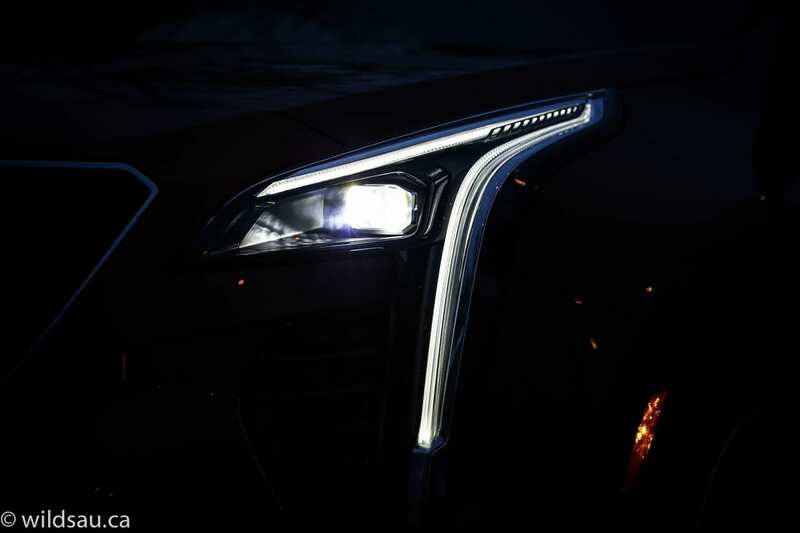 LED lighting abounds – the LED headlights are bright and very effective and the front and rear signature lighting is fantastic. 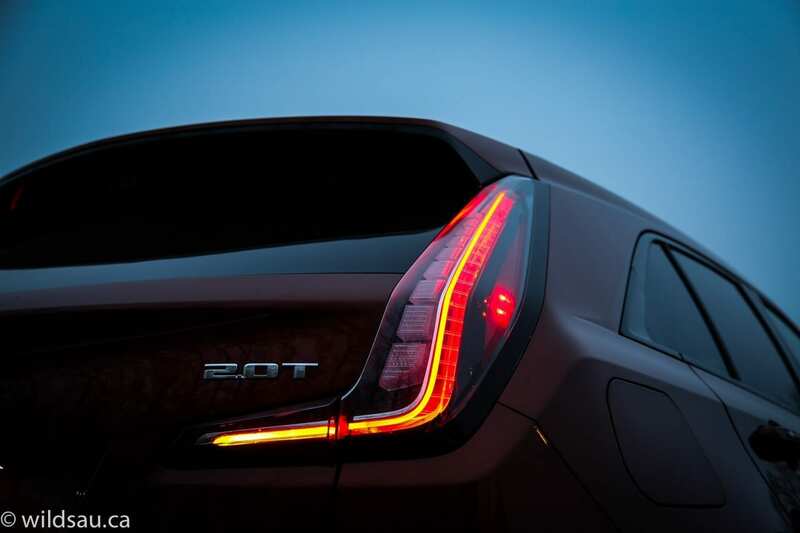 I’m a big fan of the waterfall-style LED strip headlight pods. 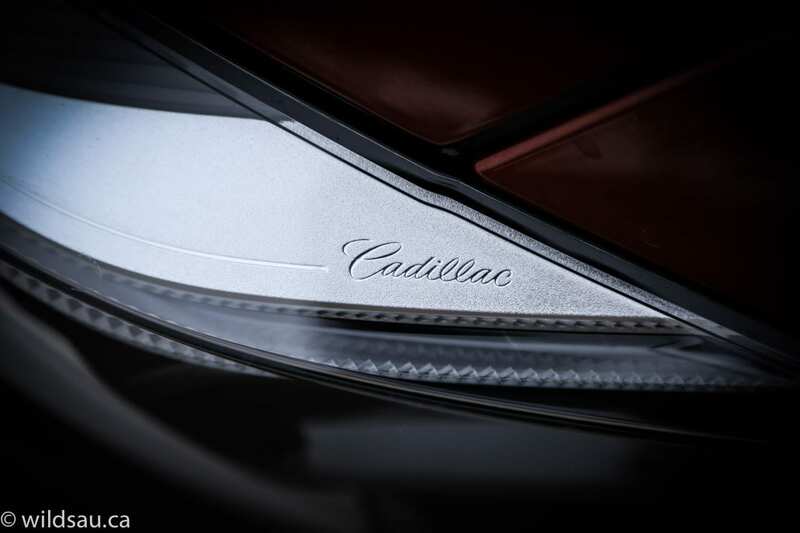 The Sport trim gets see-through tail light lenses versus the other trims’ red lenses – both look great. 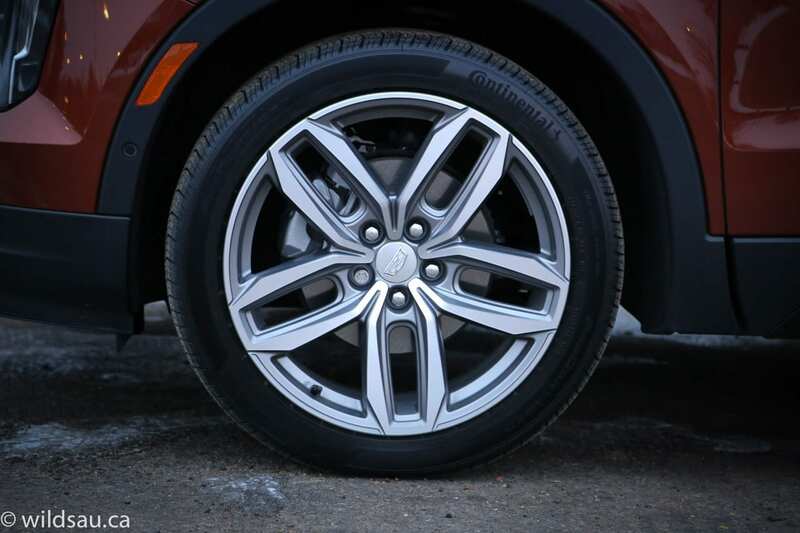 And the whole package is finished off beautifully with 20-inch twin-5-spoke rims wearing meaty 245/45-sized tires. 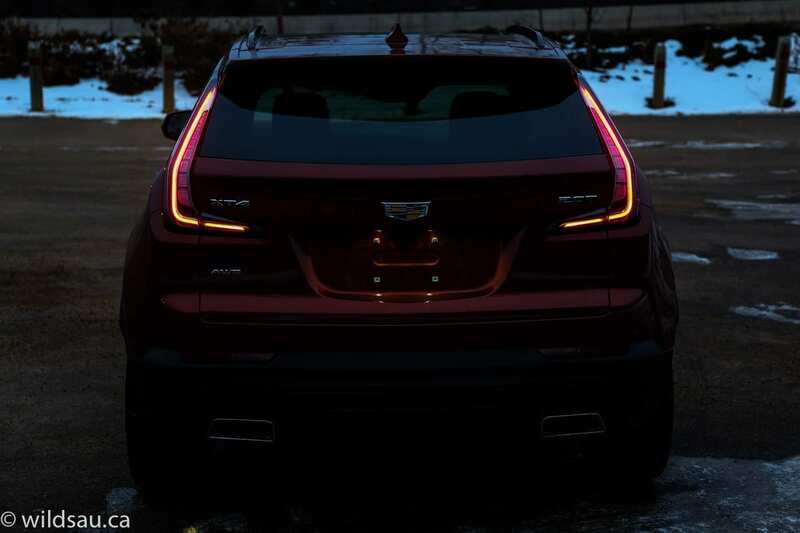 In my opinion, Cadillac’s design team did a great job with the XT4. 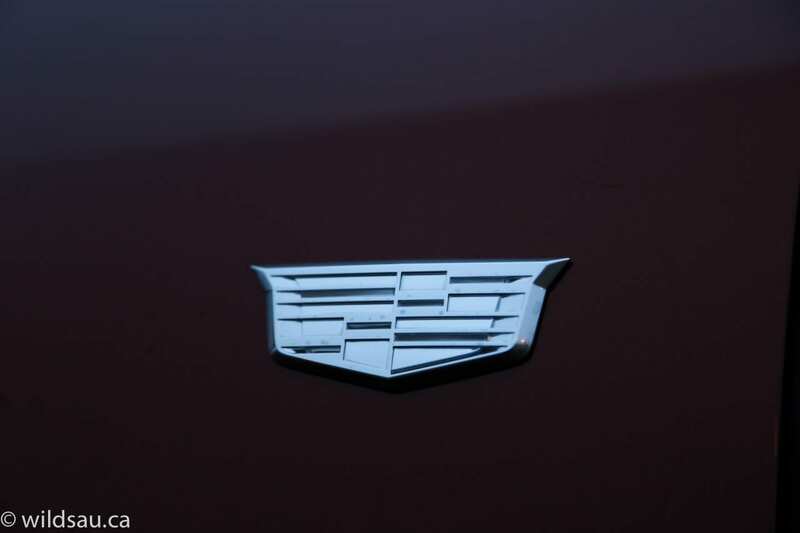 The rear and rear quarter angles, in particular, are eye-catching, modern and quite striking while remaining distinctively Cadillac. 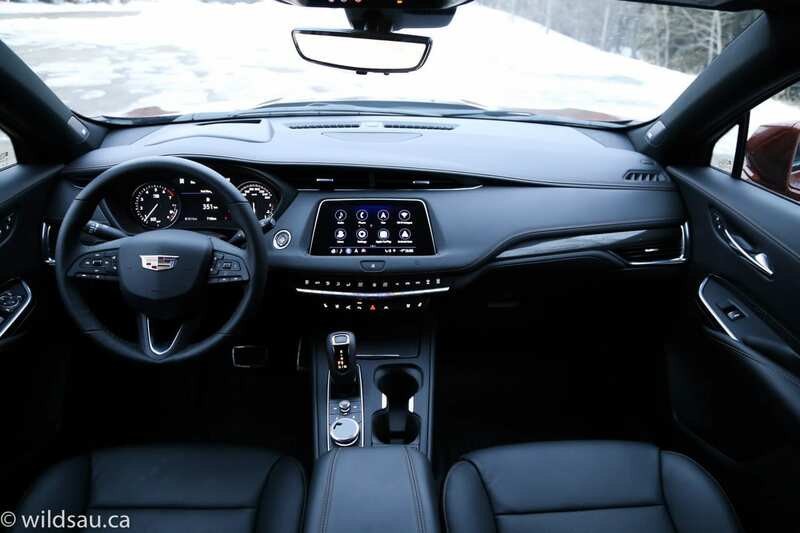 Stepping into the XT4’s upscale and hand-crafted-feeling interior is a treat, thanks to clean styling, an abundance of soft-touch plastics with luxurious textures and stitched panels. 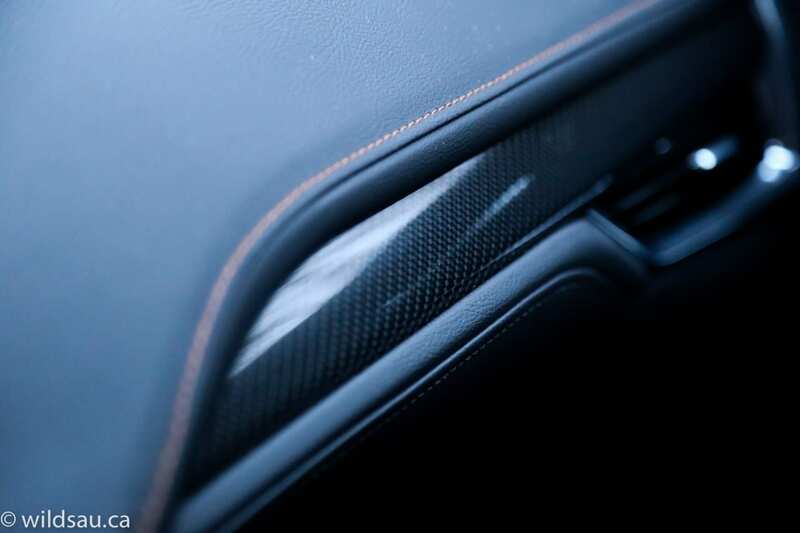 Additional flair comes in the form of carbon fibre type trim pieces. 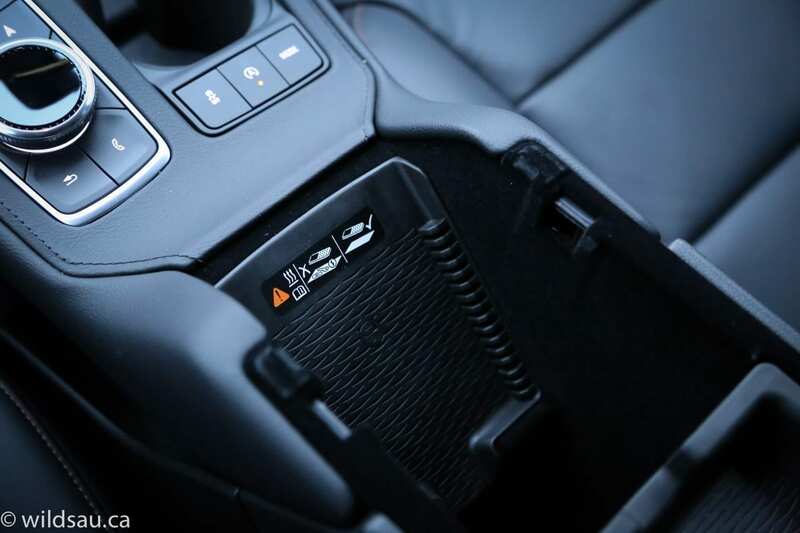 My review XT4’s Sport trim gets a few Sport specific extras – aluminum pedals, special door sills and an awesome leather-wrapped sport steering wheel. It’s heated and the fat rim has grippy, perforated sections – I love it! Behind it is a nice set of gauges and a big 8-inch configurable driver information screen in the gauge cluster. 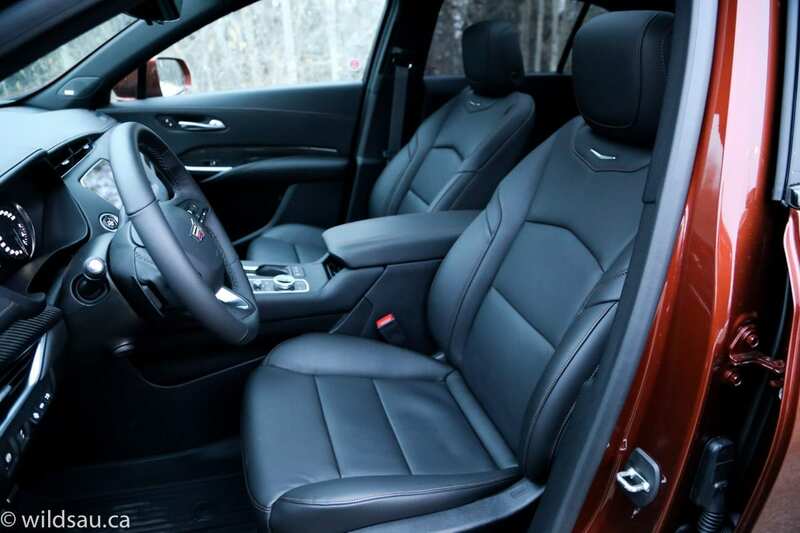 The extraordinarily comfortable and supportive leather seats are heated and ventilated. There is also a massaging function which is awesome and a tiny bit quirky. Every time the massage “lets up”, there is a quiet (but noticeable) exhaling sound. I assume the system must use air bladders that get inflated and deflated and so it sounds like you have someone on a life support respirator in the back seat every time the massage feature is on. 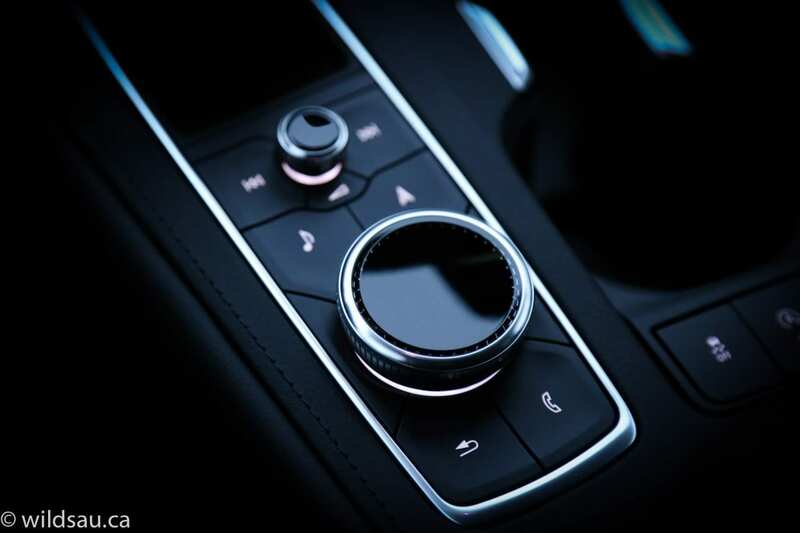 Front and centre is the CUE system that manages phone and navigation functions, vehicle settings and the outstanding 13-speaker BOSE Centrepoint sound system. I’m happy to report that the CUE interface is vastly improved. 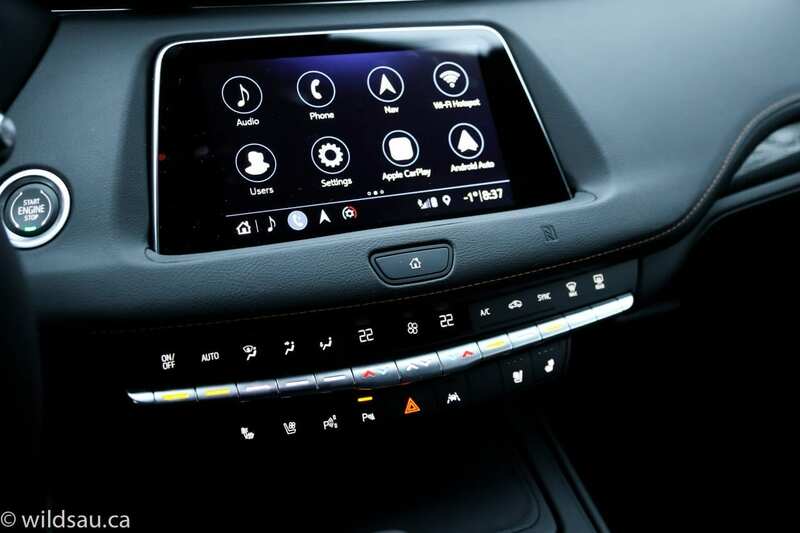 It’s a very responsive and crisp-looking 8-inch touchscreen that can also be controlled using the rotary knob on the console. 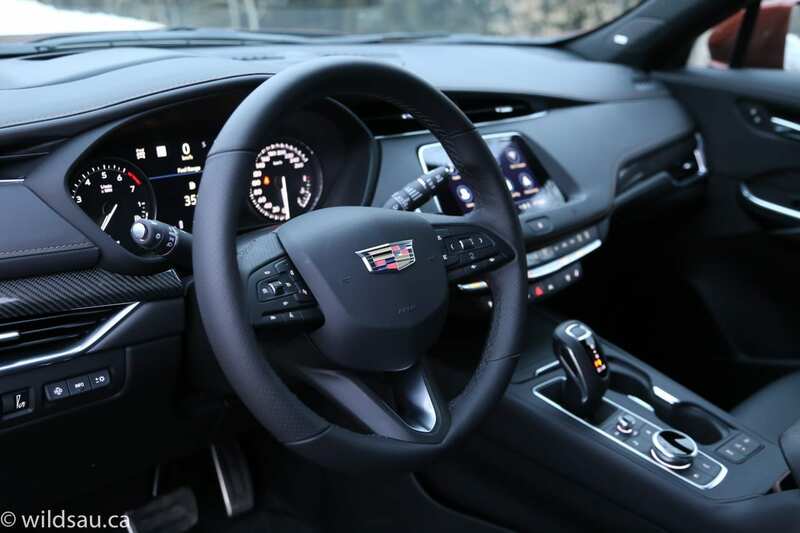 And yes, that’s a volume knob and hard buttons on the console – Cadillac has done away with those ghastly capacitive touch sliders. Ergonomically, this system is stratospherically better than previous generation CUE-based ones. 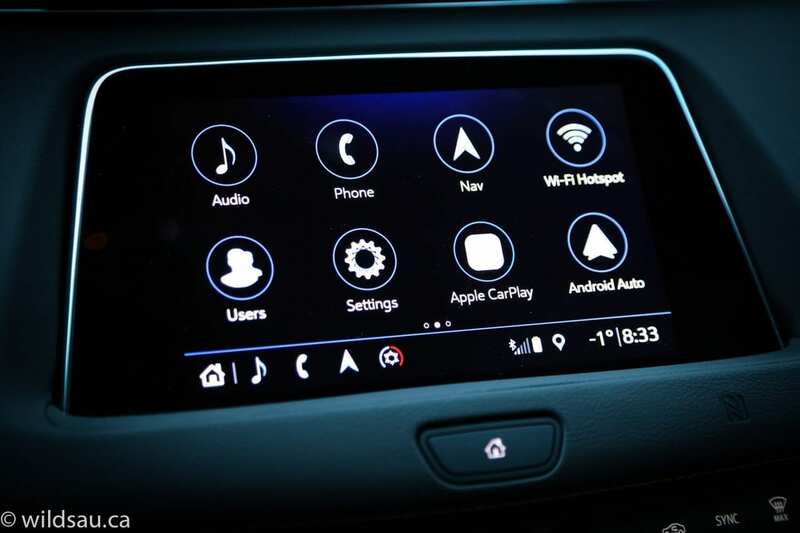 Apple CarPlay and Android Auto compatibility are standard. Optioned up like my review vehicle, the XT4 comes with a wealth of driver assistance technology – surround vision camera with an impressive high-def bird’s eye view, parking sensors all the way around, lane departure warning and lane keep assist, blind-spot monitoring, rear cross-traffic alert, a configurable heads-up display, pedestrian braking, forward collision alert, forward and reverse automatic braking, adaptive cruise control and automatic parking assist. Most of this technology stays out of your way and works well. The one slight exception was the sensitivity of the automatic reverse braking. I park in an underground parkade every day, and usually park next to large concrete pillars. While backing up, with room to spare, the system freaked out a few times and just slammed on the brakes. I am guessing it thought I was going to back into the pillar but I was probably 8 inches away. I’ve never had another system step in like that, and it scared the daylights out of me because it abruptly brings the vehicle to a stop. 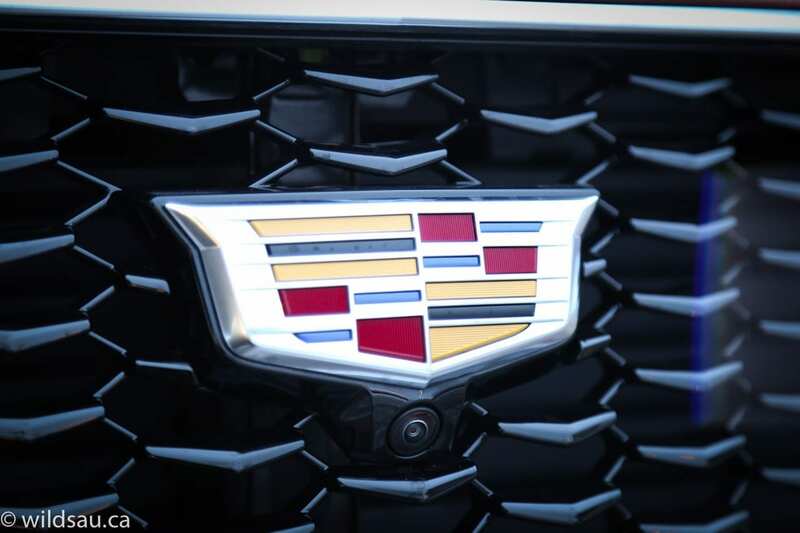 Cadillac has some unique technology that you won’t find in many other vehicles. 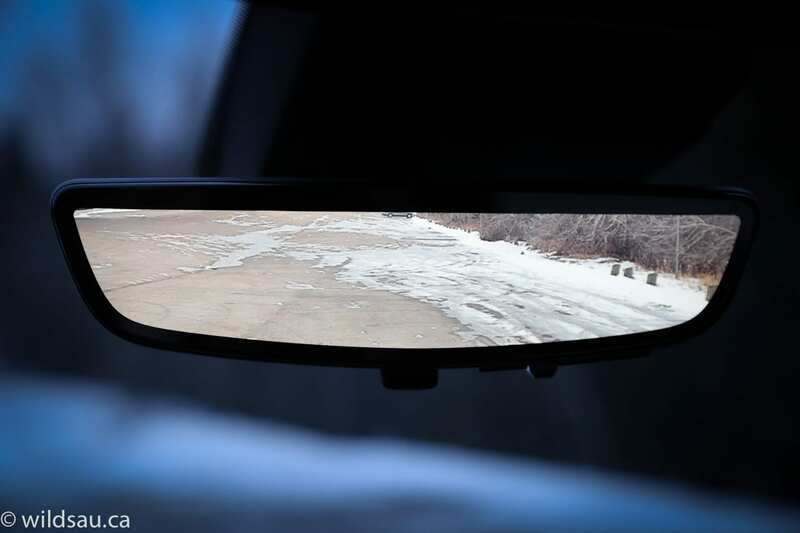 The rear camera mirror streams high-definition video and provides a wide and completely unobstructed view of what’s happening behind the vehicle. It did take me a few days to get used to that bright, clear picture to be honest. It’s also weird not to see your rear seat passengers, the rear headrests, the rear window wiper, your own hand as you wave thanks (or whatever else you might be waving) to someone behind you, etc. 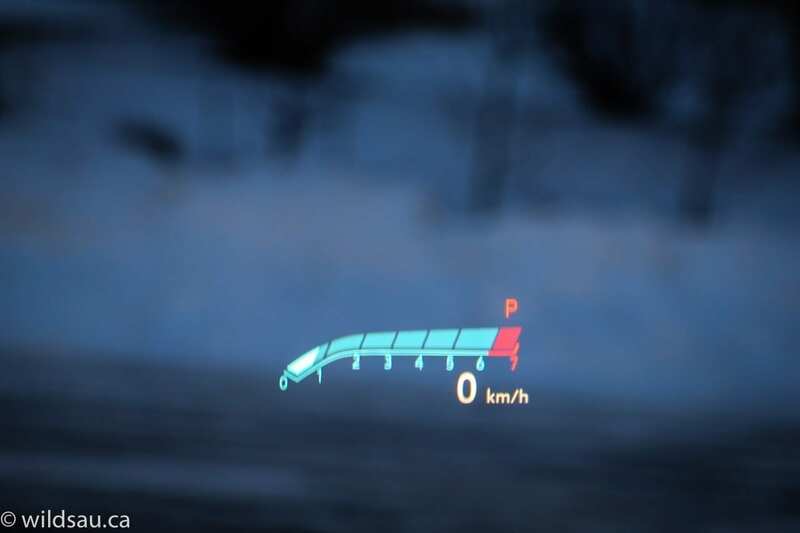 You can also revert back to an old-school rear-view mirror with the touch of a button. 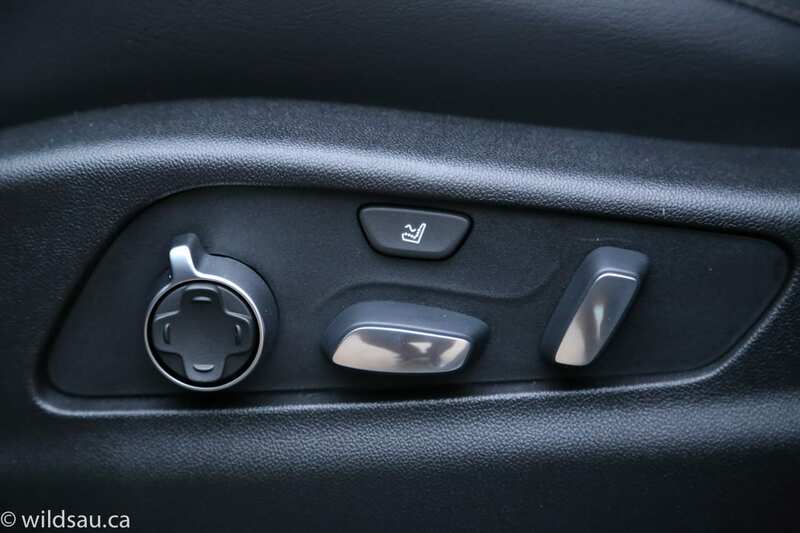 The Safety Alert seat uses discreet pulses on the left, right or both sides of your seat bolsters to get your attention. Once you’ve experienced it a few times and get used to it, it becomes a trusted ally. For the subcompact category, the XT4 offers up decent space. I’m 5’10” and had an inch or two of leg and head room to spare. The two outboard seats are heated and very comfortable. The middle position, on the other hand, is narrow, straddles a huge floor tunnel and loses leg room to the centre console. 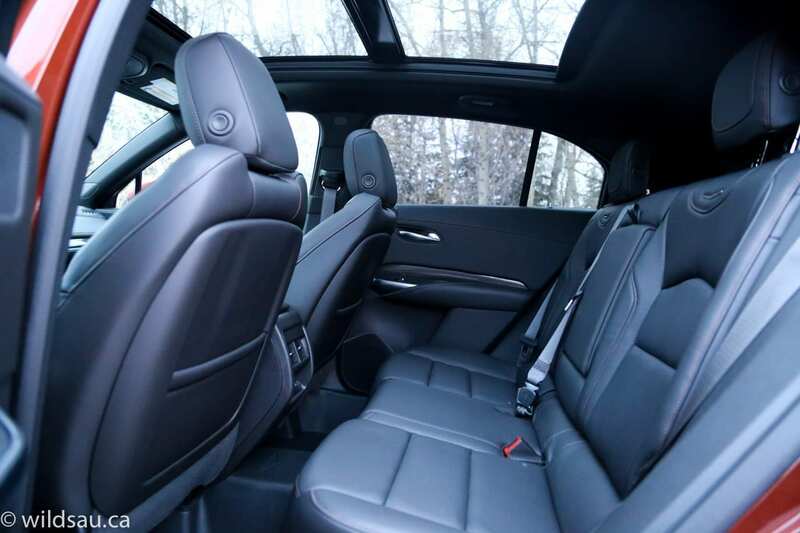 It’s not a great place to sit and even my seven year old was unhappy there – I would say the XT4 works best for up to four passengers, which is typical for this vehicle size. Rear passengers get two USB plugs – one type A and one type C – and a huge dual-panel panoramic sunroof overhead, which lets plenty of light in, making the rear seating nice and airy. If you’re transporting little ones, there are two sets of LATCH anchors for child seats. 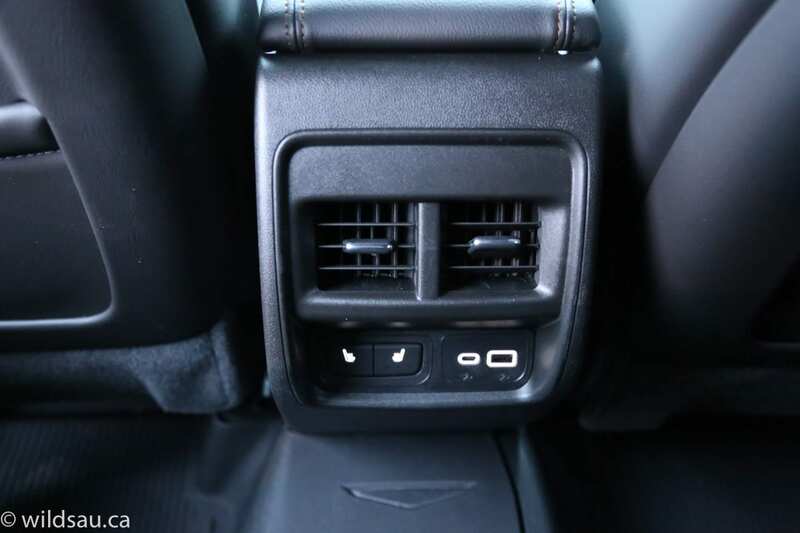 At the front of the centre console is a sliding lid that covers a bin with several charging options – two USB plugs (a type A and a type C) as well as a 12V plug. There’s a big bin under the armrest lid, and a cool angled wireless charging mat that lurks under the front edge of that lid. That means you can slide your smart phone down onto that charging space and retrieve it without having to open the lid. 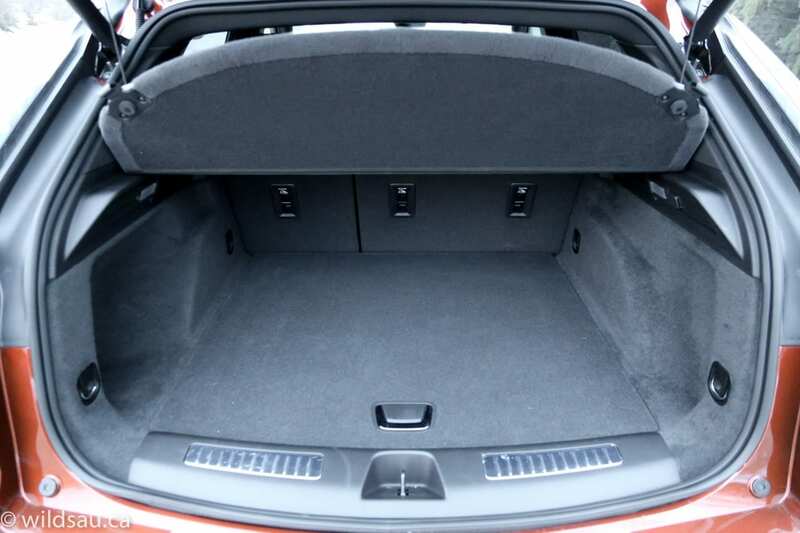 The power liftgate opens to reveal a nice high load floor and a reasonably-sized 637L trunk. If you need more space, the 60/40 split rear seats fold flat and bump that up to 1,384L of cargo room. You’ll find a 12V plug in the trunk and a hard tonneau cover/parcel shelf that splits and partially folds up and out of the way when the liftgate opens. 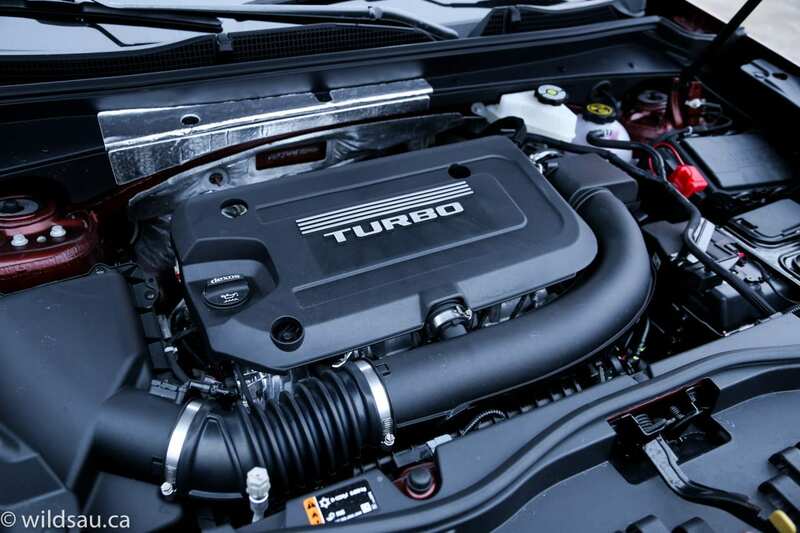 Under the hood, an all-new turbocharged 2L 4-cylinder delivers 237HP and 258 lb.ft of torque, the latter available at a deliciously low 1,500 RPM. This is paired with a 9-speed automatic transmission and a twin-clutch all-wheel drive system. 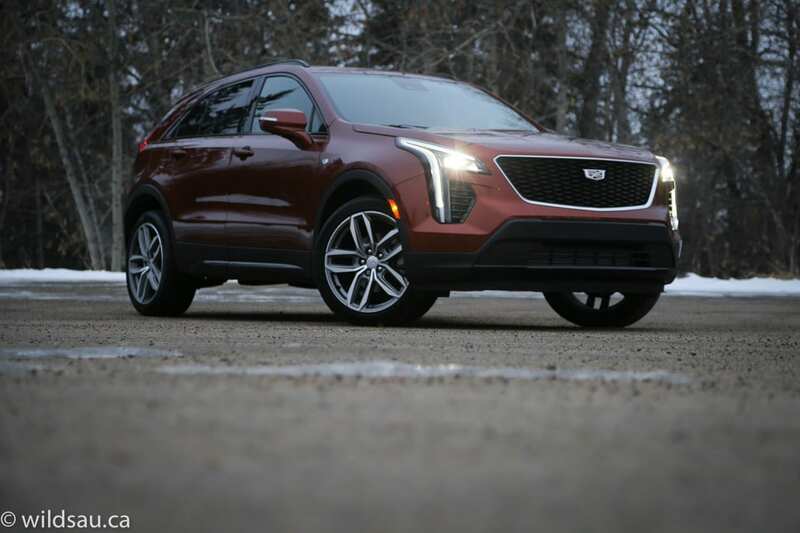 Cadillac rates this XT4 configuration at 10.9/8.2 L/100 km (city/hwy) – we ended up with a slightly higher average of 11.5 L/100 km after a week of commuting, driving kids to their activities, a few runs on the freeway and, for the last couple of days, trudging through the results of a snowstorm. The powertrain is fantastic. I found it to be mostly smooth and it has virtually no lag off the line. 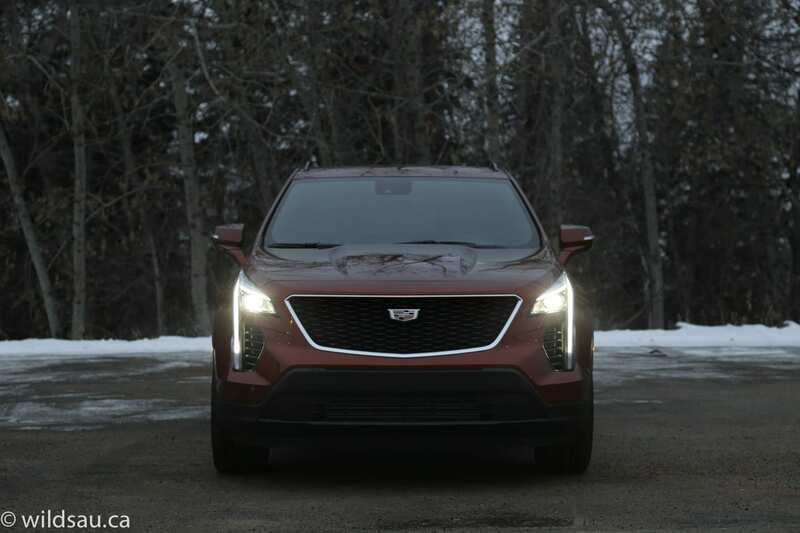 That makes the XT4 feel even faster than it is, and makes for a rewarding driving experience. It has plenty of torque for launching, and more than enough power to hold its own at any speed. I liked the transmission. The shifts are imperceptible, and for the most part, it always felt like it was in the right gear. It’s not particularly quick, but it’s fast enough. 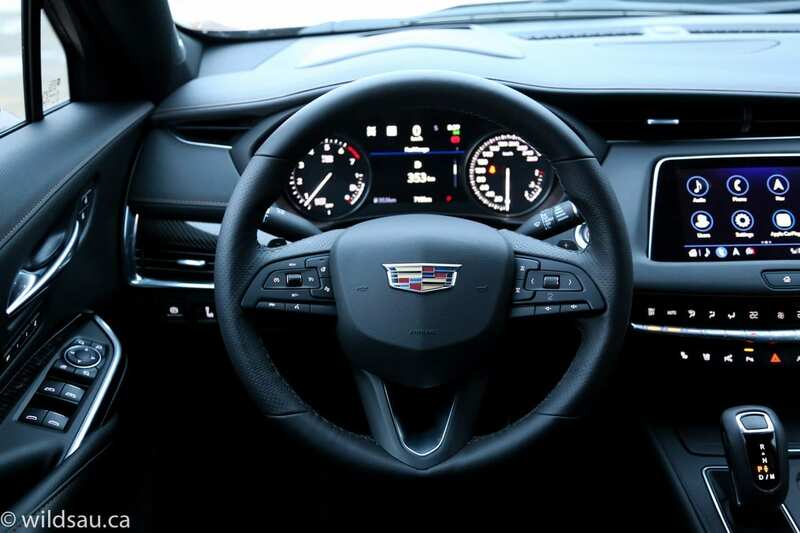 You can shift manually using the paddle shifters – but I’m not sure it adds much to the driving experience. 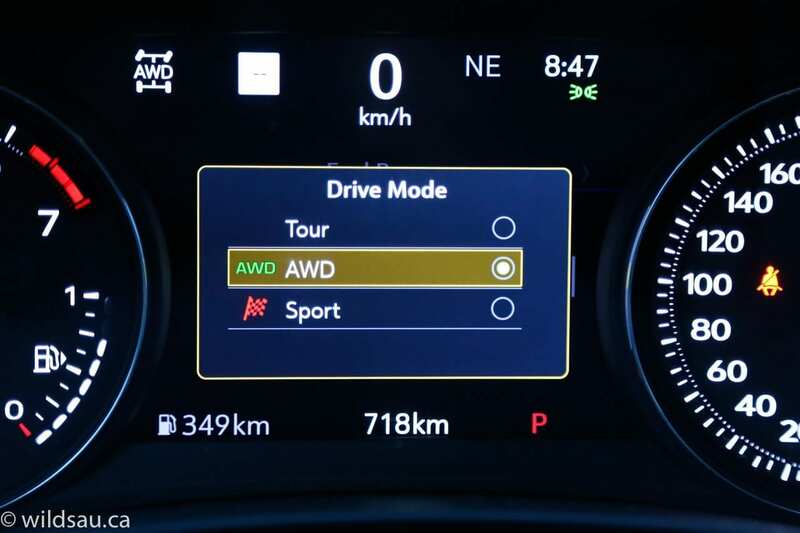 The XT4 offers three drive modes – Tour, AWD and Sport. 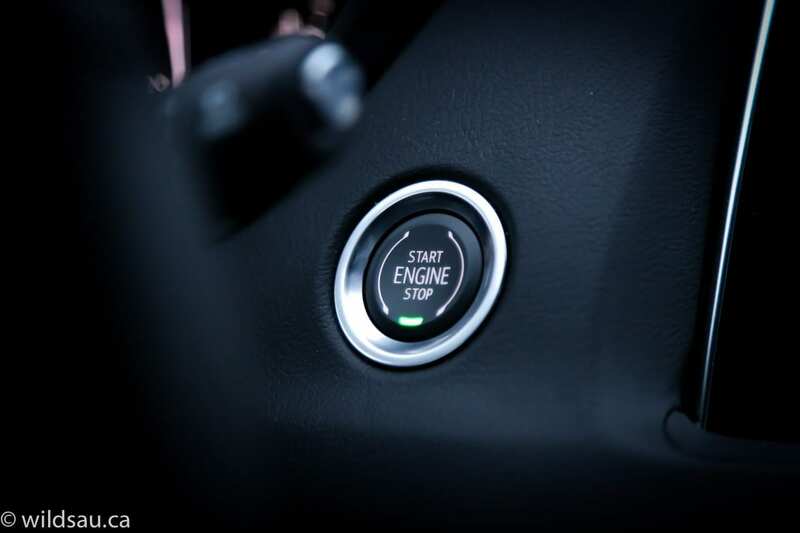 Sport bumps up the throttle’s responsiveness and will hold onto gears longer. The XT4 rides quite firmly, but always remained comfortable for us and never got crashy. The handling is decent, although there’s definitely some body roll around corners – even with the optional active sport suspension. Turn-in was reasonably quick, and the steering is weighted nicely – although it’s not very communicative. 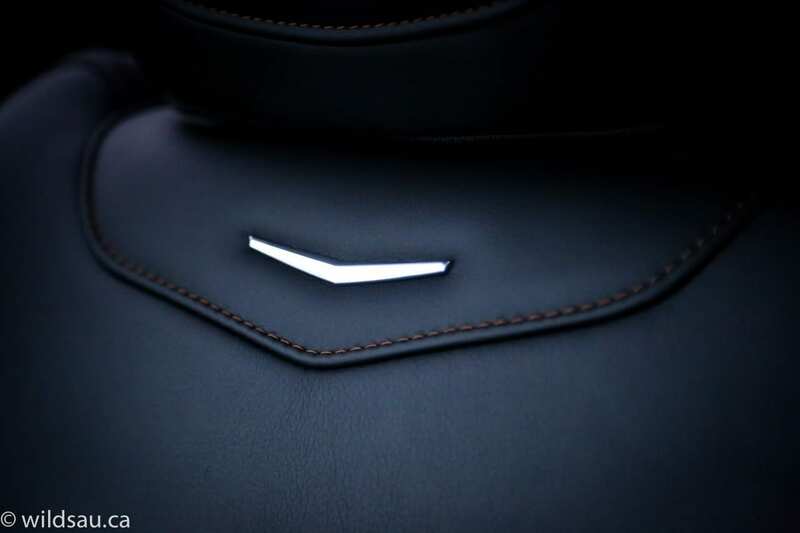 Luxury is the name of the game here – even in the Sport trim. The all-wheel drive system does a decent job and was great – until we got our biggest dump of snow so far this winter. The all-wheel drive can only do so much with all-season tires and the ones that came on my XT4 weren’t good in the snow. At all. 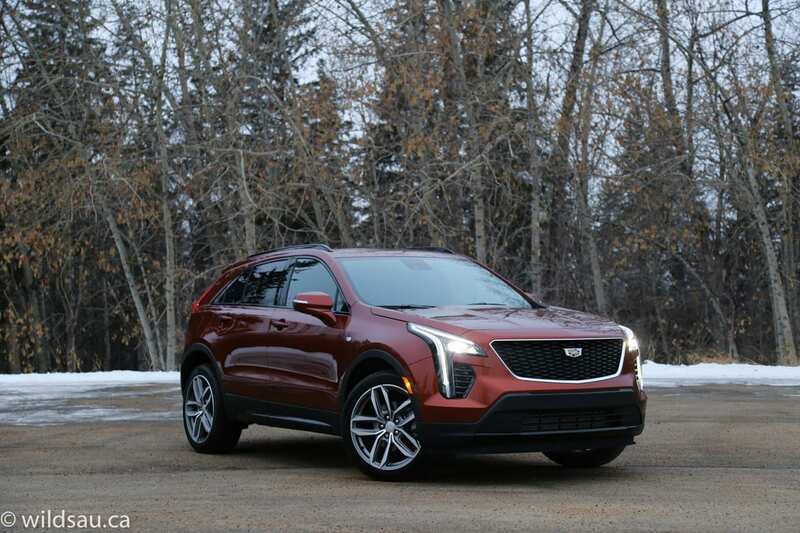 That’s not a knock on the XT4 – that’s a knock on all-season tires. As always, I recommend winter (or at least all-weather) tires. 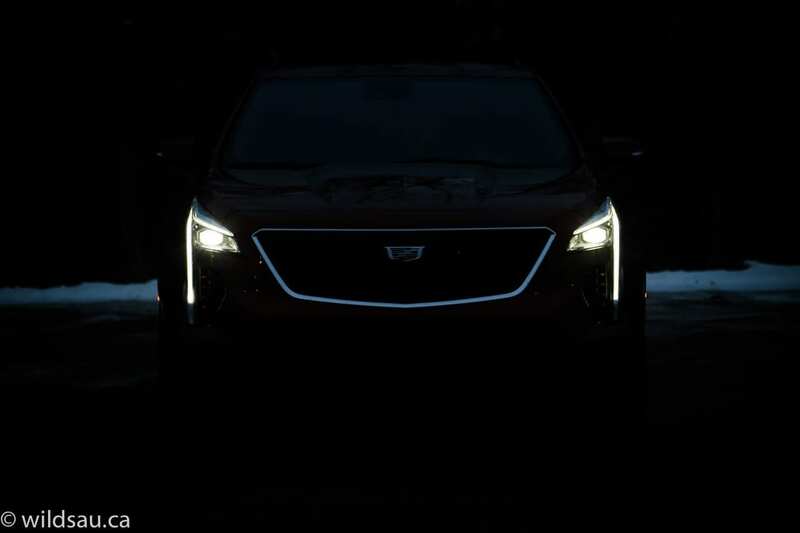 We found the XT4’s road, engine and wind noise to be very well managed, even at highway speeds – it is a very quiet vehicle. Braking is fine, and visibility out of the vehicle is quite good. While little details aren’t the things that sell vehicles, they do make me happy. The XT4 has a few goodies like this. For example, the clever little umbrella storage ports integrated into the front door panels. 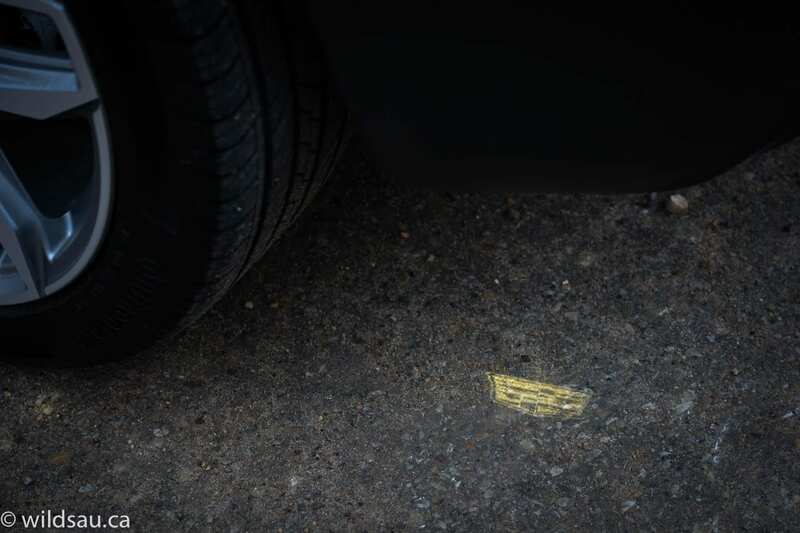 Or the Cadillac logo that’s projected onto the ground under the rear left corner of the XT4 to show you where to sweep your foot for the hands-free trunk lid opener. WAF (Wife Approval Factor) was very high. 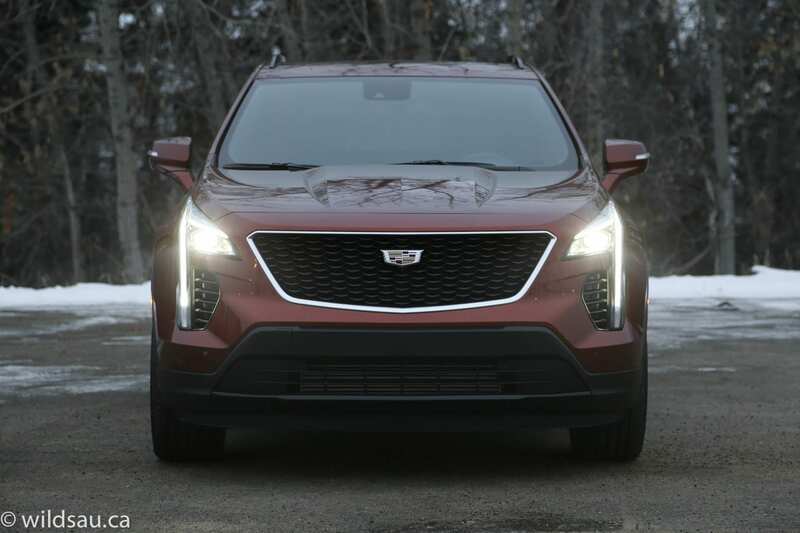 She loved how the XT4 looks inside and out, and she said it was fun to drive. She also figured out most of the technology and said it would be easy to live with. The luxury subcompact space is very competitive. Volvo’s XC40, Audi’s Q3, Mercedes-Benz’s GLA and BMW’s X1 could all be seen as players in this game, and each one brings quite a bit to the table. I think the XT4 competes well and has a lot to offer in terms of luxury, the driving experience and styling. The price definitely creeps up with the higher trims and some of the option packages and the value becomes questionable, but that’s the same for the competitors. 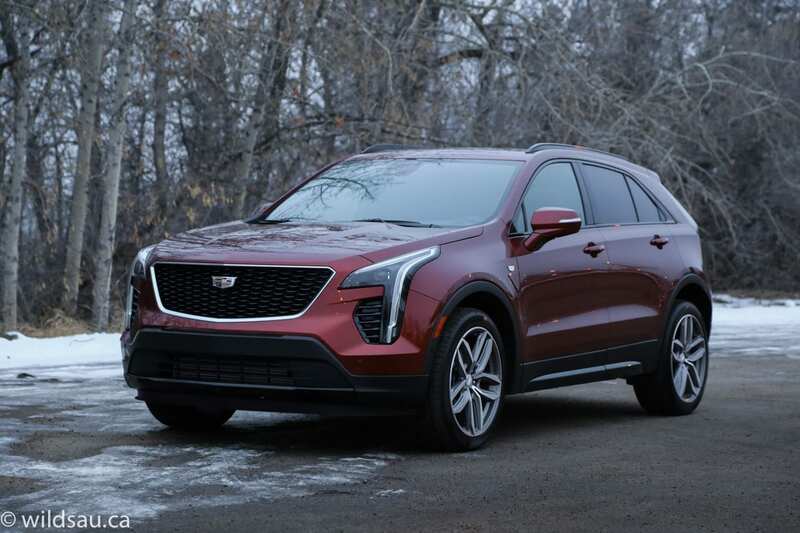 I think the XT4 checks off a lot of boxes for a lot of buyers and will do well for Cadillac. Disclosure: Vehicle was provided by Don Wheaton.